My dog Layna noticed them first while she was out for her morning constitutional. I came outside to find her standing upright on her hind legs, no mean feat for a 140 pound canine. Her head was poised upwards, gazing over the garage roof toward the Eastern forest. High up in the towering maple trees, were four wild turkeys, comfortably roosting. They slept there all summer, leaving their nightly perch as the light of dawn hit the tree ridge. And then, ever so gracefully, they would glide down to the valley below. 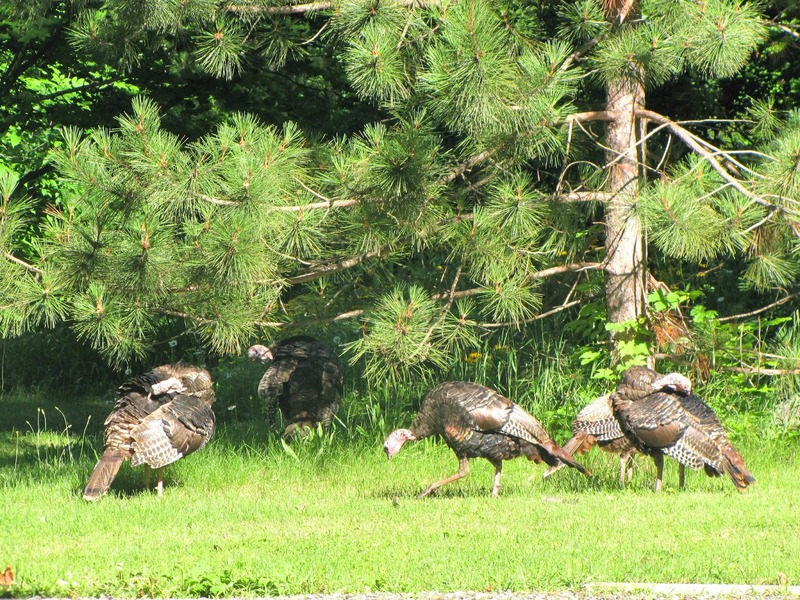 One morning, the marching parade came to a sudden halt as the lead turkey stopped at the base of our driveway, about 100 feet from the porch. A slight moment of hesitation seemed to hang in the air like a Salvador Dali clock. The line behind him started to wiggle and jiggle as if made of a long roll of jelly turkeys. Maybe in cruising past our place, they had observed other birds feeding at the maple tree in the yard? Whatever the trigger, suddenly, with a burst of chaotic energy and feathers flying, they all raced helter-skelter down the driveway toward the feeding tree. Phooey to the Pecking Order – it was every wild turkey for itself. Road runner style! Many of my friends call Blue Maples a “Bird and Breakfast”. Like a drive-through restaurant for wildlife, I place seed out at the feeding tree daily for our 48 mourning doves, 37 Blue Jays, countless red-wing blackbirds and grackles, a smattering of chickadees and juncos, a few, lovely red cardinals, two ravens, five annoying squirrels, and six kamikaze chipmunks. The numbers vary with the season. Finches, pine siskins, hummingbirds, orioles, robins, warblers, rose and yellow grosbeaks feed in another designated section of the forest restaurant. But that morning, my diversified bird clientele were not prepared for this tumultuous tsunami of copper-hued feathers barreling down the driveway toward them. I am sad to report that all regular bird clientele flew madly off in all directions. Three distinct thoughts entered my mind simultaneously. Thought number one. 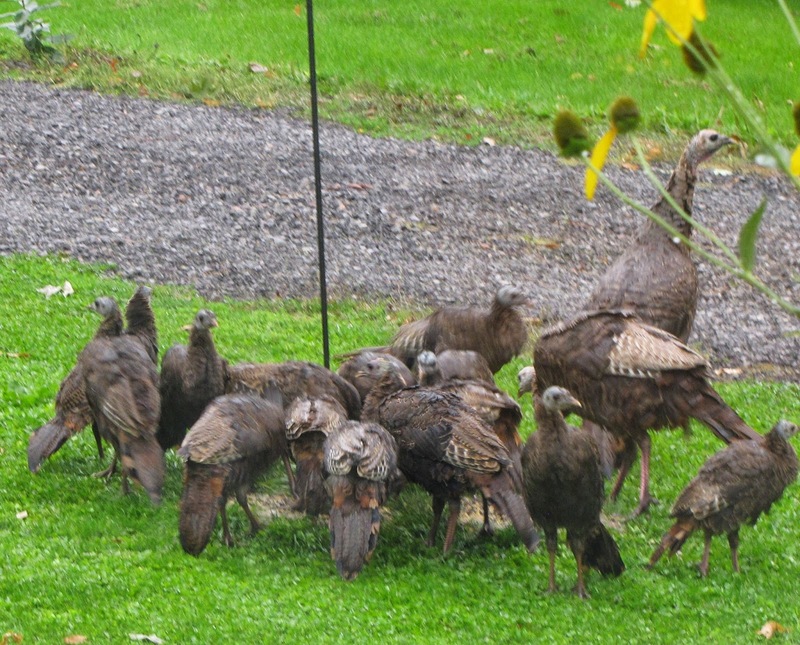 Had the wild turkey flock been casing my joint for the past week, pretending to be uninterested in the feeders - while stealthily figuring out how to take Rome? Thought number two. Ever seen a stand-off between squirrels and turkeys? The squirrels ran about hyper-ventilating in ever-increasing circles around the tree, trying their best to agitate the flock away from the seed – to no avail. Finally, something had put squirrels in their place. Thought number three. Watching the disintegration of the pecking order brought a delicious sense of inner delight to me, as I had recently retired from thirty years in the bureaucracy. Timing can be so sublime. 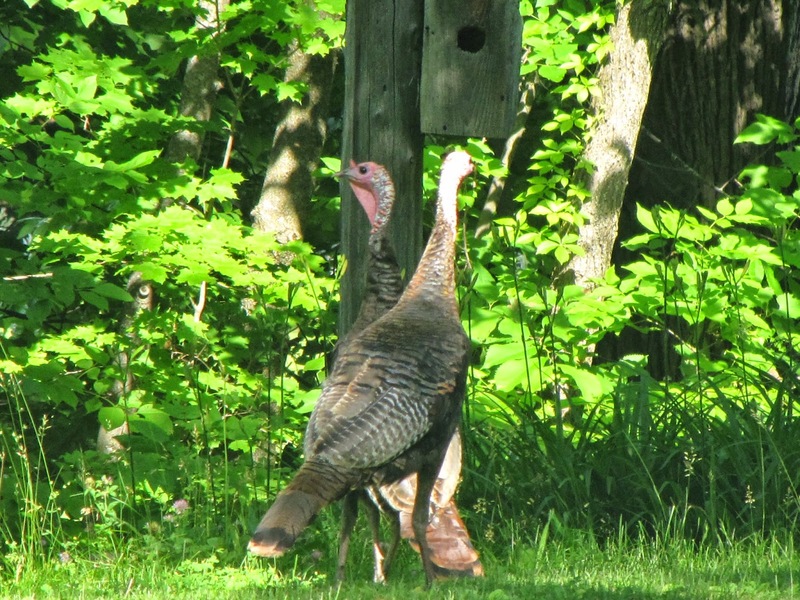 The wild turkeys are now part of our regular clientele, albeit we had to develop a slightly revised training program to fit them into our diversified clientele. I learned to imitate their major calls, so they would come toward me when I approached. My father used to call me a turkey - maybe he was on to something. They preen, they play, they joist on our front yard every year. Sometimes they chase each other with a left leg over right leg side-step that must have spawned the turkey trot – a dance popular in the fifties. They are tribal with rituals - and appear to genuinely care for members of their own. As in many areas across North America, wild turkeys were extinct in Ontario for nearly a century due to habitat loss and unregulated hunting. 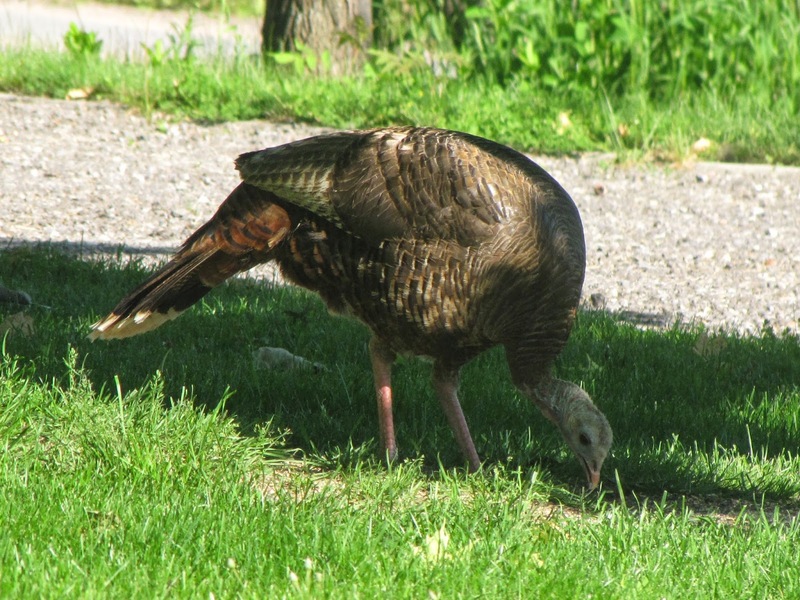 As reported by National Geographic, the loss of habitat was most challenging as wild turkeys thrive in areas that are part deciduous forest and part grassland. When forests are cut down, brood cover, a major breeding requirement is lost. Brood cover is the wooded area that provides overhead protection and easy ground movement for young turkeys or baby poults. For the past 25 years, dedicated partnerships between conservationists and government has resulted in the successful restoration of wild turkeys to most of their former range in Ontario. These efforts have led to a mandatory course to hunt turkey and to regulated hunting. Here in the natural forests of Blue Maples, we have witnessed their rites of passage and totally enjoy the sheer joy of their life energy. Take a peek at this minute or so movie of the strutting dominant Jake cruising his brood of hens for the upcoming breeding cycle. A future blog post will feature this rather interesting breeding rite, as well as the exuberance of baby wild turkeys that come to the feeding tree, along with their watchful moms, Lilac and Goldie.